Exquisite penwork chinoiserie sewing box in sycamore, the top decorated with vibrant painted Chinese figures within a pretty grapevine border. The vibrant colours continue on all sides with more fruit and flowers. 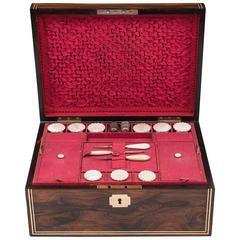 Lifting the lid of this penwork sewing box reveals a pink lined interior and a fully fitted sewing tray with six unusual turned and carved cotton spools, two cut-glass scent bottles, painted wooden thimble, two removable sliding sewing boxes with painted flowers, needle case and many sewing pieces. Stands on four pressed brass ball feet. Pressed engraved brass side handles. The box has two cards inside, one reading ‘Mr Starkey, Wrenbury Hall’ and another ‘Mr R L Vawdrey’. The village of Wrenbury in Cheshire was listed in the Domesday Book in 1086 when it was known as ‘Wareneberie’. Wrenbury Hall is believed to have been built in the 1400s and until 1920 was home to prominent local landowners, the Starkey family. The 19th century chinoiserie sewing box with fitted interior, drawer and dragon gilt-wood carved feet. The tea chest has floral designs and on the front it has naive Chinese style figures drinking and serving tea. 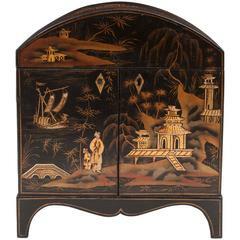 19th century chinoiserie game box.